Mr. Koie from Sapporo Breweries accompanied by Mr. Hejduk/E.A.T. 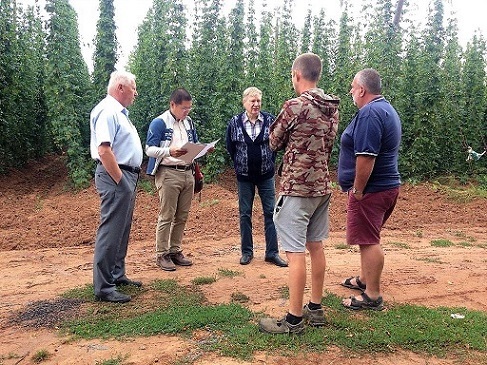 Czech paid a visit to our hop farms and experimental hop garden of V.F.Humulus on August 10, 2018 in order to check the hop garden state. Anticipated hop yield and quality, health state and chemical treatment during the vegetation were discussed in detail. All CCFS hop farms received the written evaluation of the samples from last crop. The best hops from the crop 2017 were supplied by the farm Chmelex Horesedly.